It was in November 1956 that Melbourne surprised the world with its Games. 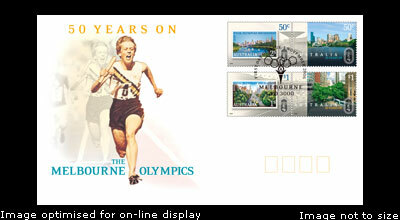 In November 2006, Melbourne awoke from it Olympic slumbers to celebrate that wonderful occasion fifty years before. 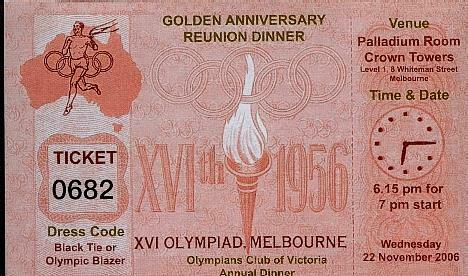 More than 320 Olympians from 1956 have arrrived to attend the festivities from 18-22 November, 2006. This includes over 130 International athletes featuring over 20 Gold Medallists such as Ronnie Delany (Athletics 1500m), Al Oerter (Discus) and Pat McCormick (Diving). All of Australia's 13 remaining gold medallists including Dawn Fraser, John Devitt and Murray Rose have also confirmed their attendance. One of the central items in the celebration is a special reception at the Melbourne Town Hall on Saturday 18 November. It is expected that all of the gathered 1956 Olympians will be in attendance. 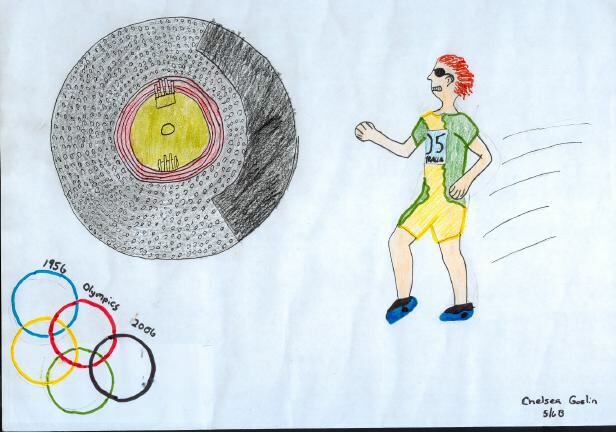 Each of the 1956 Olympians was sent a Welcome Pack and Ray Smith's pack contained the following painting by one of the students at Altona Meadows Primary School (http://www.amps.vic.edu.au). Altona Meadows Primary School is one of the many schools involved directly in the celebrations and will have some 100 students involved in the re-enactment of the 1956 Opening Ceremony at the famous MCG on Sunday 19 November. 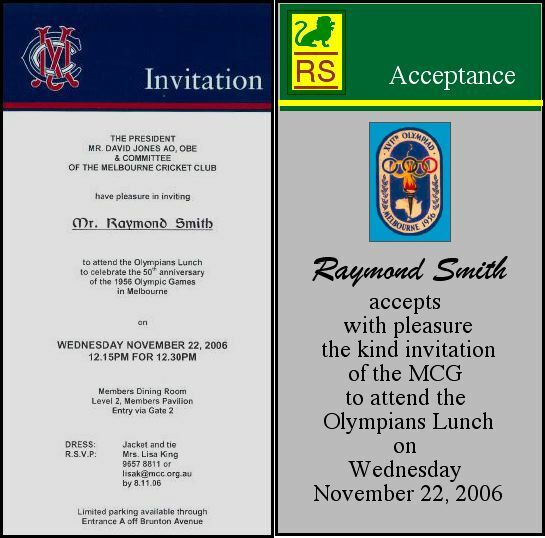 Other special functions include an Olympians Luncheon at the Melbourne Cricket Ground and a 1956 Reunion dinner at Crown Towers, both on Tuesday 22 November. These will be occasions for the 1956 Olympians from around the world to relive old times and past tales.. and Ray will be there! Amongst the special commemorative items are two crystal urns with the names of all the 1956 Olympians and Medallists. 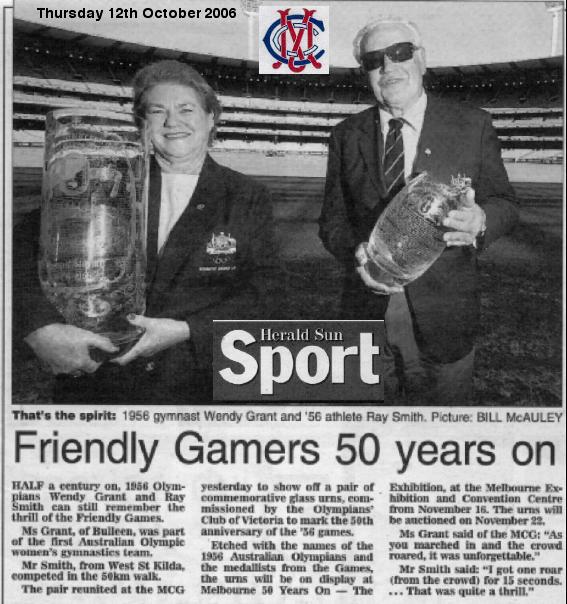 Ray and Wendy Grant showed them to the gathered media at the MCG in one of many promotional opportunities. The spotlight is back once again on the Olympic Village in West Heidelberg. The Heidelberg West Olympic Village community of past are presenting a special event on Saturday 18 November – 'Olympic Village Celebrates 50 years'. Ray and thrower Charles Morris represented the Victorian Olympic Council at the official opening of the celebration in the village. I am sure it brought back many wonderful memories for the two Olympians. 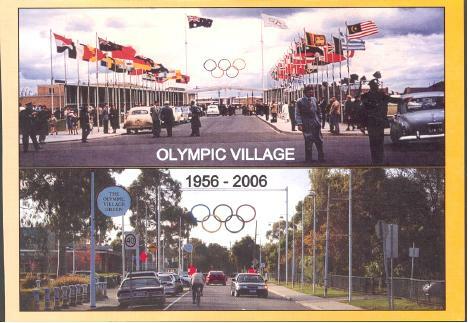 November 2006 marks the anniversary of the opening of the Olympic Village for the purpose of housing athletes for the 1956 Olympic Games held in Melbourne. The Heidelberg Olympic Village was the first of its kind in the world and was hailed a great success. Over the years since, village life has not always been so healthy with many residents experiencing adversity and disadvantage. There has however always continued a strong heart of resilience and hope for the future. The Heidelberg West Olympic Village community are marking their 50th birthday with a celebration of the village’s rich and diverse history. Olympic Village Celebrates 50 years will be a festival of fun, sharing and learning. Set in the heart of the village, under and around the Olympic rings, there will be historical displays and tours, 1956 athletes to meet, kids’ activities, music, art, performances, food, reunions, community information, stalls and local legends. Just as Olympic Village housed athletes of many nations for the games, so today the village welcomes and includes people who have come from many nations. Australia Post has even brought out a series of 4 stamps, mirrored on the set which were produced to mark the 1956 Games.